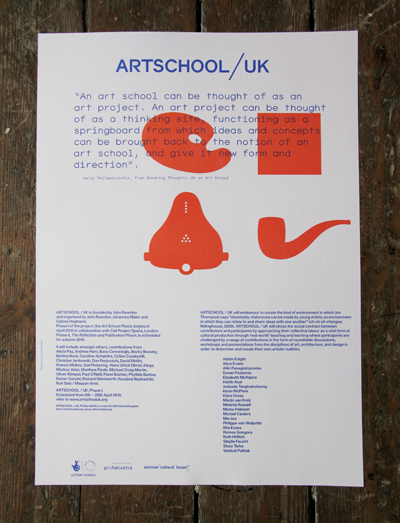 ARTSCHOOL / UK is founded by John Reardon and organised by John Reardon, Johannes Maier and Sabine Hagmann. Phase I of the project, the Art School Phase, April 2010 in collaboration with Cell Project Space, London. Phase II, The Reflection and Publication Phase, scheduled for autumn 2010. It will include amongst others, contributions from Alicia Paz, Andrew Hunt, Banu Cennetoglu, Becky Beasley, Bettina Buck, Caroline Achaintre, C?line Condorelli, Christian Jankowski, Dan Perjovschi, David Mollin, Francis McKee, Gail Pickering,? Hans Ulrich Obrist, Klega, Markus Vater, Matthew Poole, Michael Craig-Martin, Oliver Klimpel, Paul ONeill, Pavel B?chler, Phyllida Barlow, Rainer Ganahl, Richard Wentworth, Rosalind Nashashibi, Ruti Sela / Maayan Amir.